Cocoa's first birthday was December 27th. I let him out of his cage to play for a while and give him a present. First Cocoa tried opening his present. 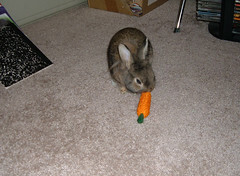 I decided to help Cocoa and bust open his gift which was a Flip N Toss carrot. (from Super Pet) I think he likes it! 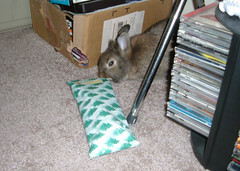 Cocoa also received a bunny blankey a few days after his birthday. I have a new video up of Cocoa. He was playing with the newspaper in his cage and made a little tunnel out of it. It was the cutest thing ever!!! Hoppy belated birthday, Cocoa! Looks like you got a nice present with that carrot. How many seconds did it take you to shred it? Hrmph. Too cute! We love the video. Yeah, happy belated birthday Cocoa! My mom says that you are adorable. And it looks like you gots yourself some nice gift there! Looks like she's playing peekaboo!